Cobra Heart’s 1 Year Anniversary includes free merch and cupcakes! This week is going to be a very, very busy experience for San Diego locals and tourists alike. One of the best parts of Comic Con week happens outside of the convention center doors, as music venues, bars, and restaurants open their doors to all sorts of characters and fans for music and art events. Many can argue that Comic Con has become warped from what it once started as; however, on the plus side, the convention always sparks a fiery interest in the arts among San Diego’s culturally conscious scenes. Below are a few events taking place tonight and later this week. So if your week was looking a little boring…consider these events your remedy against monotony. Enjoy! Rips Entertainment is featuring Filter, a showcase of art and tunes from some of San Diego’s most intriguing acts this Thursday, and best of all, the event is free in your Comic Con attire or with your Comic Con badge. From the vast musical tastes of Southern Cali DJ act Burn One, to the atmospheric pulse behind AbJo’s style (seriously check out The Art of Refixing below, and tell me it doesn’t make your heart beat a little faster.) — not to mention the art that FILTER events are known for, this is going to be one of the best ways to spend a Thursday night. The entire event will be covered and streamed live on Breakbread.tv (as well as The Griffin event below!) if you can’t be there in person. Oh yeah, I did mention it was free, right? Comic-Con isn’t the only place crawling with celebrities this week. The Griffin is opening its doors to convention goers with a set list featuring A-list indie acts. SD favorite Hills Like Elephants always brings the indie party and never disappoints. Actors Sarah Roemer, Ryan Donowho, and Tim Jo paired up with bassist Joe, drummer Chad, and Steve Saba to round out Animals of Kin, an indie folk band that calls The Mamas and Papas a musical influence. (And rightly so!) There’s plenty of other amazing acts on this bill — Goodnight Ravenswood & Seawall — plus a little art to make sure you’re culturally well-rounded. My mouth is watering at the indie goodness! It’s an 80s dance party this Friday Downtown, as Hotline Miami hosts its own little video game-themed mini Con, complete with DJ acts and music inspired by and from the indie game of the same title. However this event is not for kids, since it’s a 21+ drinking party with a headlining DJ set by Australia’s Miami Horror. Dancing shoes? Check. Video games? Check. Amazing DJs? Check. Sounds like a Comic Con after party heaven. Let us know if you’re attending any of these events! Get out there and shake your Con Cons, amigos. Music and art have always been combined, and most people do it right. (read: local Beats and Brushes event hosted by RiPs Entertainment.) Psychedelic performance art rockers The Red Paintings do it with a flair that will keep your ears peeled and your eyes glued to the stage. Trust me when I say, you have never seen or heard anything like this. That’s why our Guilty Pleasure of the Week segment is coming back with a bang in the form of this Australian, genre-bending, orchestral rock group. Fascination pretty much surrounds this music project, from the moment you listen to the music, to the story behind how lead singer and musical mastermind Trash McSweeney began his musical journey. One near-fatal seizure and many inspiring moments later, and The Red Paintings was born. Gimmicky bands are sometimes a hit or a miss, but with this group the gimmick is simply artful, colorful, mesmerizing and sometimes downright acid-trip inducing entertainment. Woven around all of that creativity is a voice that isn’t quite perfect but manages to fit into the theme of the music completely. 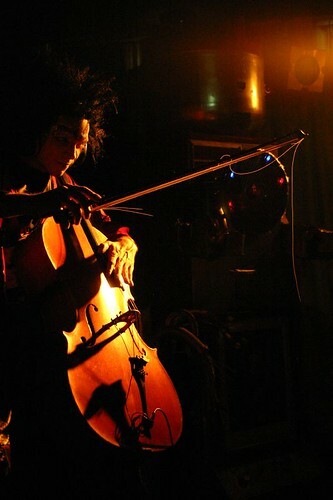 Add in the sweet yet ominous sounds of string instruments, which are usually included in their live ensemble as well, and The Red Paintings succeed in creating its own little Tim Burton-esque world. The performance is theatrical, and sometimes over-obsessed with Alice in Wonderland, but the music is more than just a soundtrack to a play. McSweeney croons one moment and sears through his lyrics the next, as the dynamics of each song rise and fall like a tumultuous ocean. Still, beautiful pseudo-ballads such as “We Belong in the Sea” are just as alluring and can stand alone without the stage antics. In essence, the entire package of The Red Paintings is perfect, complete with a big red bow on top. This is the kind of music experience that is extremely fun to watch live, especially since the group adds in a real-time art collaboration featuring local artists at each of their tour destinations, and even occasionally including human canvasses. Alright, now are you convinced? If you are, head over to the Griffin on Valentine’s Day (February 14th, in case you forgot), for The Red Paintings, Stone Horse, The Falling Doves and others.